If the NY Comedy Festival is at one end of the comedy festival spectrum, then the Del Close Improv Marathon resides at the absolute opposite end. I am really excited to report that the 11th Annual Del Close Improv Marathon is, like, just around the corner. Dude. Taking place from August 14th – August 16th, the 56-hour NON-STOP improv marathon will take over 4 stages in NYC and will bring to us the absolute best improv from New York, Chicago, Los Angeles, Boston, Washington DC, Chapel Hill, Raleigh, Phoenix, Austin, Philadelphia, Finland, Hawaii, Baltimore, Ontario, St. Louis, Toronto, and more. FINLAND?! AND MORE!?!? This marathon is important to me because New York is so absolutely saturated with improv troupes. So much so that the scene is really hit-or-miss for me. So hit-or-miss that I rarely venture out to see improv comedy (the only thing that makes me sadder than bad improv is the end of Blade Runner). But with the Del Close Marathon, there are no misses. It is the best of the best, from start to finish. Del Close was the driving force behind improvisational comedy in Chicago for over 30 years influencing Bill Murray, Tina Fey, Mike Myers, John Belushi, Chris Farley and the Upright Citizens Brigade to name a few. 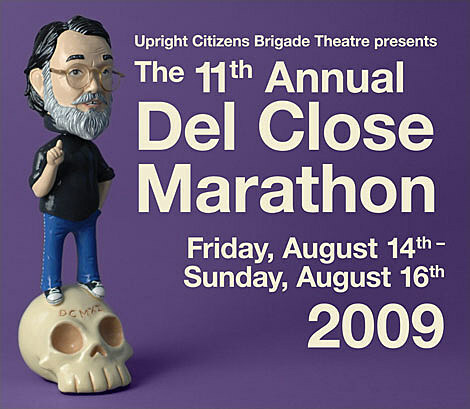 After Del’s passing in 1999, the UCB started the Del Close Marathon to celebrate their mentor and keep alive his name and teachings for future generations. Highlights of this years festival include 30 Rock-prov (featuring Donald Glover, John Lutz, Tami Sagher, and more), Horatio Sanz and the Kings of Improv (featuring Horatio Sanz of Saturday Night Live) and reunions of classic UCB Theatre groups The Swarm and Respecto Montalban (featuring Rob Huebel and Paul Scheer of Human Giant, Rob Riggle, and more). The Marathon will conclude with a special performance of ASSSSCAT at F.I.T.’s Haft Auditorium, featuring members of the Upright Citizens Brigade (Matt Besser, Ian Roberts and Matt Walsh). Shows will be taking place at the UCB Theater, Hudson Guild Theater, Urban Stages, and the FIT Kate Murphy Ampitheatre. The FIT Haft Auditorium will play host to that single ASSSCAT mega show. The schedule is insane, but with the help of the glorious time table set-up by the organizers, creating your own itinerary should be a cinch. $25 weekend passes are available at the UCB Theater as well as the other participating venues. The F.I.T. shows are $12 and are likely to sell right out, so buy your F.I.T. tickets ASAP. Improv pioneer Del Close’s farewell party from Chicago Reader on Vimeo.